In this Eighth Chapter, Kṛṣṇa has explained that yogis endeavor to know the true self. Some yogis successfully realize that the true self is intimately linked to the super-self. They thus start to develop feelings of thankfulness, respect, and love towards the super-self. All material goals and aspirations disappoint, but yogis attain a goal which is far beyond even the topmost heaven of this material world. Especially the yogis who develop love for the super-self attain an unparalleled goal. To explain, anything which has a beginning has an end. But something that never begins will never end. And in fact, the only thing which can never end is something that never begins. “Unmanifest” means something that never began. This is why the spiritual world, unlike even Brahmaloka, never gets destroyed. It never ends because it never begins. “Infallable” literally means, that which does not fall. The spiritual world never falls to ruin, because it never rises to existence. The spiritual world does exist. In fact it is the paramount of existence. So Kṛṣṇa calls it paramāṁ gati – the topmost reality, the topmost goal. Prabhupada translates that the spiritual world is the “Supreme destination.” However, the spiritual world does not exist within the confines of any timeline with reference to causality (karma) that effects beginnings and endings. This may be a terse philosophical point, but since this is a part in the Gita where Kṛṣṇa is discussing vedāntic conclusions, I think it is our service and duty to put our minds into clear mode, high gear, and dig into the depth of the philosophy being expressed. I think that meditation and contemplation upon these thoughts in serenity will produce personal realizations of the subject being discussed. Answering this Kṛṣṇa says, yam prāpya na nivartante – “When you leave the material timeline and enter that imperishable reality beyond cause and effect – you too become freed from cause and effect. You too never again fall to run. Yam prāpya, when you get there… na nivartante, you never fall back. We often attain goals, and later lose them. For example, for a while I was quite famous in a certain subculture. Now I am not as famous, and certainly after another generation or two I will be completely forgotten. Or in 2000 and around then I had a lot of financial wealth, which previously I did not, and now I also no longer have at all. The goals we attain in the material world of competing egos are always lost after some time. But the accomplishment attained by the devotional yogis is something they absolutely never lose. You can consult the Katha Upanishad 1.3.11 for further confirmation of these points. Kṛṣṇa is paraphrasing that text very closely in the current verse of the Gita. So, yogis who strive for self-realization, if very lucky, come to realize the intimate relationship between the self (ātmā) and super-self (paramātmā), and thus develop emotions and feelings of love for the super-self. We go to where our desires lead us – that is constantly true, in this world as well as in yoga and spirituality. If we develop loving desires for the super-self who intimately supports us, then we will actually go to where the super-self resides in a personal form that we can intimately relate with. So devotional yogis (bhakti-yogis), they attain the “dhāma” – the residence of Vishnu, the personality of the super-self. “Dhāma” is shorthand for Vaikuntha dhāma. Depending on the flavor of loving feelings the yogi develops for the super-self, he or she goes to a place where the super-self manifests a form and personality most appropriate to reciprocate those feelings. The supreme abode of all supreme abodes is the place where the super-self manifests a form and personality most appropriate for reciprocating with the most supremely intimate of all intimate forms of affection developed by the devotional yogis. This is the ultimate meaning of tad dhāma paramam mama. This form is Kṛṣṇa and the place is Vṛṇdāvana. The Brahma-samhita gives elaborate descriptions of what that place is like. One can read that book for more information. One particularly sweet line from that book is veṇuṁ kvaṇantam aravinda dalāyatākṣaṁ – In that sweet supreme abode, the devotees enjoy uninterrupted spiritual bliss as Kṛṣṇa plays his lovely flute, batting the long eyelashes on his crimson rimmed lotus eyes; peacock feathers adorning his hair, glistening saffron-yellow clothes flowing in the breeze, as he stands dramatically and sensually in a S like shape, hips thrown out lusciously; his hue the color of a mountain of sapphires lit from behind by the rising sun! 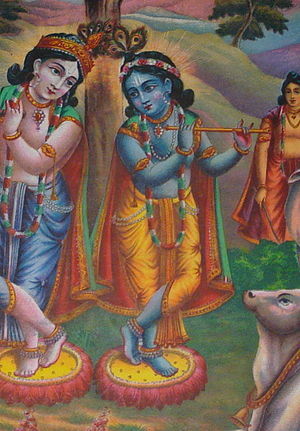 Śrī Śrī Guru Gauranga Jayatau. Hare Kṛṣṇa, Hare Kṛṣṇa, Kṛṣṇa Kṛṣṇa, Hare Hare. Previous Why So Many Religions? Next Self-Realization in Krsna Consciousness is EASY?? ?